Astore experience begins in Padua in 1929 when Pietro Bertacco establishes one of the first companies in Veneto in leather industry. Pietro promptly proves his craftsmanship making with passion leather handbags with a unique style in line with the taste and fashion of his time. The great competence and expertise make him from the beginning one of the most successful italian craftsmen of the time. His leather purses, wallets and belts make themselves notice in the italian market. His artisan business starts a flourishing period of expansion, and a very important acknowledgement of his competence arrives in 1975 with the awarding of the title of Cavaliere. Pietro' son Mario continues the father’s path with the same spirit and enthusiasm. He moves the headquarters in the province of Venice, where Astore are even now. Mario gives new vivacity to his bags, with more attention to all the details, looking for new materials, making studies on leather and tanning. He realizes leather purses, wallets, fashion belts, being inspired from women, their tastes, femininity and the way they actually are. Nowadays Roberto and Pierpaolo keep on the family artisan tradition and the made in italy brand. With great ability they create leather handbags, shoes and accessories unique in their sector. 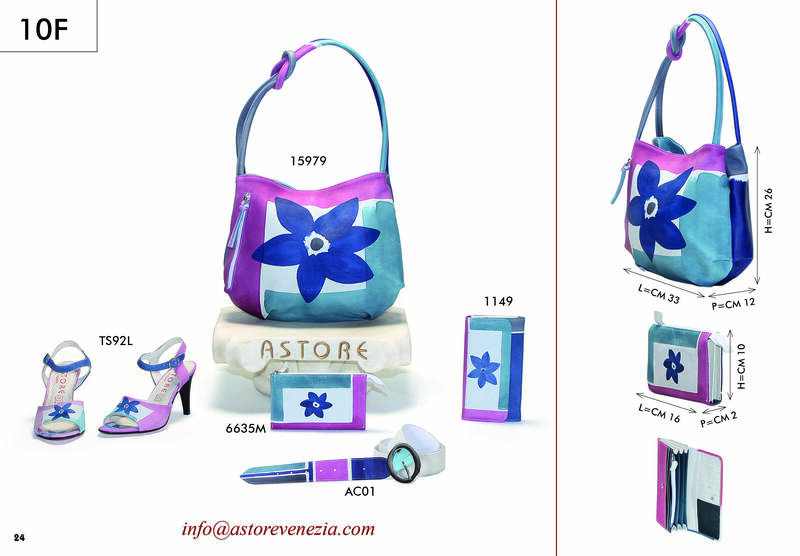 The fantasy, good taste and continue renewal are the key-words of Astore style nowadays. The most appreciated lines of handbags and purses such as acquerello, lux, solar e business are made with hand painted leather, with the mastery of craftsmanship which usually identifies Astore like the only brand capable of inventing fashion and tendency of our days. Astore company sells leather handbags and shoes all over the world.